Most cattle operators view open cows with some degree of disappointment. However, you might be surprised at the amount of revenue that can be realized from cull cow sales. Cull cows happen. It may be age, injury or some other reason, like bad feet, bad udder, bad disposition or a failure to bring a calf to the branding. But every year, just about every beef producer takes a trip to town with the cows and bulls that fell out of the breeding program. And often, beef producers look at that annual rite of fall as a disappointment at best or a management failure at worst. But look at it another way and it becomes an income center. I recently summarized the Kansas Farm Management data on Kansas cow-calf operations from 2010-2015. Participating operations had an average herd size of 126 head, weaned an 84% calf crop, sold 106 calves and 20 head of breeding stock or cull animals annually. In the 2015 data, the average gross income of participating operations was $118,710, the sale of breeding stock or culls generated $28,453 of that figure. Thus the sale of cull animals accounted for 24% of the participating operations gross income. Although marketing cull breeding stock/cows is often viewed as a loss, it is a significant source of income that should not be overlooked. Most cull cows are sold through local auction markets. Therefore, understanding the market and making timely marketing decisions is one the most important components of realizing the most dollars out of a cull cow. 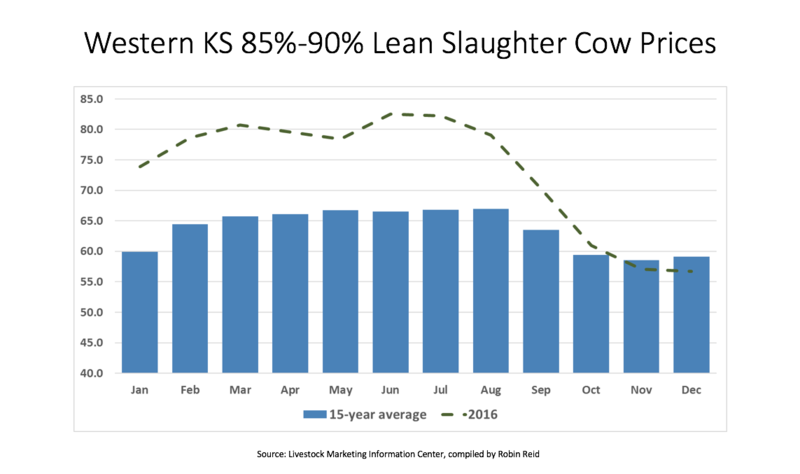 Figure 1 illustrates the 15-year average and 2016 slaughter cow prices in western Kansas. Slaughter cow prices tend to be highest and relatively steady from February to August, and then decline rapidly, being lowest in October, November and December. These months are usually the worst time to market a cull cow based on the seasonal nature of the market, as it aligns with pregnancy determination and weaning on most spring-calving operations. Therefore, if open cows are identified in late summer and are in good condition, marketing those animals as soon as possible would likely result in higher price than waiting until later in the fall. If open cows are identified later in the fall, deferring marketing until late winter/early spring and placing cull cows on low-input feeding program that would add additional weight and condition (provided resources are available) might be more advantageous than marketing those animals immediately. Waggoner, an Extension beef systems specialist with Kansas State University, is based in Garden City.